The following article, cross-posted from eJewish Philanthropy, is part of a series of follow ups from the Jewish Early Childhood Educational Leadership Problem Formulation Convening held in May 2015. Below, three of the participants make the case for more rigorous applied study in the field, specifically in the area of compensation for ECE educators. Educators of our community’s youngest children are more than just teachers. In both the secular and Jewish context, early childhood education (ECE) educators occupy a deeply influential place in the lives of families. These are the formative years of a child’s development of cognition, personality, and identity – including religious identity. For the entire family, ECE is a window of opportunity for engaging parents and any siblings in Jewish life and learning. A critical piece of this engagement puzzle is talented, valued educators. But unfortunately, in far too many communities, Jewish ECE educators are seemingly forgotten, viewed as dispensable and easily replaceable individuals. Our community must do more – from better wages and benefits to ongoing professional support – to compensate ECE educators and to retain them in our schools. For both secular and Jewish ECE educators, wages often lag far behind other teachers, bordering on “unlivable” depending on city and home institution. In the Jewish education arena, the call for change is especially urgent, given that that Jewish ECE is a gateway and often the first, critical step to a family’s lifelong, meaningful Jewish journey. Twenty five years ago, the monumental National Child Care Staffing Study demonstrated the disproportionate relationship between the impact of ECE educators and compensation. Unfortunately, little has changed over time. A new study released just last year – Worthy Work, STILL Unlivable Wages: The Early Childhood Workforce 25 Years after the National Child Care Staffing Study – reveals a litany of unfortunate findings like inadequate wages and a lack of premium for educational attainment. As just one example, the annual average salary in 2012 of a full-time educator working with children ages 0-3 was $27,248. While these findings are deeply unfortunate, at least the secular education world can point to this study and have it as a starting point to create positive change. Sadly, in the Jewish community, where we count and measure so much – who is a Jew; how many affiliate; how do they feel about Israel – we do not have a detailed national picture of the educators who comprise ECE and the compensation they receive for their work. Rather, we have a tiny number of community-specific studies that paint a depressingly bleak picture about how these teachers are valued and compensated. In the Denver/Boulder area for example, Jewish preschool teachers only earn about 60 percent of what kindergarten teachers earn with equivalent education. In the San Francisco Bay Area, a study conducted by the San Francisco-based Jewish Community Federation and Endowment Fund showed that in 2012, ECE educators at nine institutions had an average hourly salary of $20.75. In any community, this would be difficult to live on. In the Bay Area, it essentially is impossible. Other communities can point to other studies showing similar realities. This type of compensation simply does not reflect the importance and impact of ECE. How do we know this? Because those same community studies prove on a local level how critical ECE is for the child, the family, and a Jewish community. Preschool is parents’ first educational choice for their child and family, one that can propel them into lifelong Jewish engagement. When children enjoy Jewish learning and rituals at school, they bring them home, introducing them to the entire family. 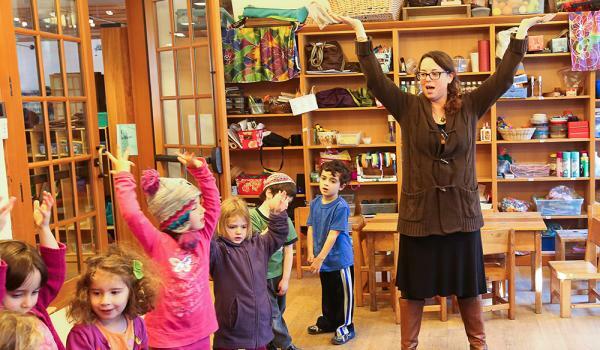 Studies also show that Jewish parents in their 20s, 30s, and 40s who choose Jewish preschools in part do so because they seek a network of other Jewish parents with whom they can build community. And parents who form Jewish peer groups through their child’s ECE center are more likely to be actively engaged in Jewish life in the future. But the family ECE experience only will be a positive family ECE experience if the learning offered is of high educational quality. To help ensure this, educators need to be valued, should receive ongoing professional support, and, to minimize turnover and attract the next generation of ECE Jewish educators, should be compensated on a par with comparably educated teachers of older children. In these areas, we are failing. Although the secular education arena has made only minimal improvements in these areas too, as noted in Worthy Work, those positive changes have been difference-makers. School-sponsored ECE programs, for example, are more prevalent than ever before and compensate their teachers more than Jewish ECE programs. Subsequently, those programs attract and retain high-level teachers who engage children in high-quality education programming and attract increasing numbers of families. This makes it even more difficult for Jewish preschools to find teachers and attract those same families. Why does this “battle” for families matter so much? When the Jewish community loses out on families with young children, we generally do not see them again – or see them very sporadically. Beyond these positive local initiatives, let’s methodically determine how and at what level our ECE educators should be compensated. Moreover, we know that when synagogue and JCC ECE centers operate as effectively and efficiently as possible,revenue for the entire institution increases, especially when families engage in the synagogue or JCC and become paying members. But we should track this information nationally to gain a deeper and fuller understanding of what high level ECE means for a community and its institutions. This type of applied study – systematic research with a focused purpose – will help determine our community’s next steps to improve the ECE experience and to better support its educators. The Consortium for Applied Studies in Jewish Education, a community of researchers, practitioners, and philanthropic leaders, already has facilitated important discussions around the Jewish ECE space. Now, CASJE is intent on leading these important applied study efforts. Armed with this national data to buttress our current understanding of ECE’s pivotal role, communities will be better positioned to make informed decisions about allocating funds and other resources. We can encourage and support communities to maximize public funding, to offer scholarship funds, and to increase ECE hours to serve working families – which also will increase revenues. To be sure, we believe that a serious commitment to Jewish ECE starts with a commitment to its educators. The Jewish camp and Jewish day school world made this commitment to their educators years ago. The future of our youngest generation deserves no less. Janet Harris is director of early childhood education at the San Francisco-based Jewish Community Federation and Endowment Fund. Lisa Farber Miller is senior program officer for Jewish life at Rose Community Foundation in Denver, which supports early childhood education and new parenthood, recognizing these are formative times when Jewish identity and new family norms are created. Marcy Whitebook, Ph.D., joined the Institute for Research on Labor and Employment and established the Center for the Study of Child Care Employment in 1999. Her research focuses on issues of employment in settings for young children, the relationship between good jobs and the quality of services available to children and families, and appropriate and accessible professional preparation for teachers.